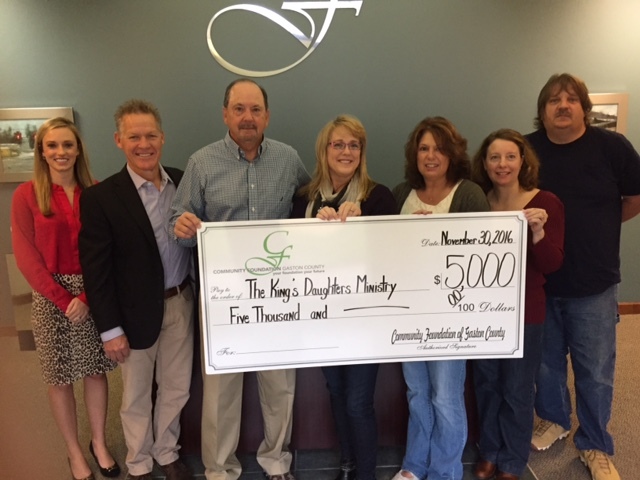 Stanley, NC (11-30-2016) – The King’s Daughters Ministry is pleased to announce it has received a $5,000 grant from the Community Foundation of Gaston County. These funds will be used to help build the laundry room at our Emerald House Shelter. The Community Foundation awards annual grants through a competitive application and review process. “This grant puts the phrase Cleanliness is next to Godliness into practice by providing for a laundry room at the shelter for women and children,” remarked Ernest Sumner, CFGC Executive Director. The King’s Daughters Ministry is a residential ministry providing counseling, education and daily life skills to women age 18-30 and their children who may be homeless, battered, self-harming or recovering from substance abuse. Our mission is to prove a safe and loving environment that fosters spiritual growth, emotional healing, and practical education to hurting women and their children. For more information, visit www.kdmonline.org or call our office at 704-263-4204. About the Community Foundation of Gaston County The Community Foundation of Gaston County is the leading steward of philanthropic giving by connecting donors with community needs to enhance the lives of present and future generations. The nonprofit organization has invested more than $82 million in grants and scholarships over its 37-year history. At its core, the Community Foundation is an organization created with gifts from generous people committed to local causes. For donors, the Foundation serves as a philanthropic advisor. For the community, the Foundation serves as a grant maker and a civic leader. Through the support of its donors and fundholders, the Foundation has been able to address some of the community’s most pressing needs, including hunger, housing and education. For more information, visit Cfgaston.org.